An exciting cepage of Pinot Gris and Sauvignon Blanc, exhibiting lovely spiced fruit characters and crunchy expressions of the orchard that are so titillating, your friends will be in fine spirits even before lunch arrives! You'll find each drop just perfect for refreshing every palate just in time for the next sip. 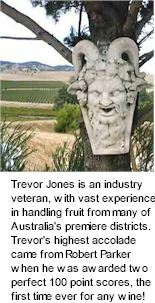 A mostly Pinot Gris wine with a smaller proportion of Sauvignon Blanc, harvested from choice vines on the Adelaide Hills and Eden Valley, planted to grey and brown loam sands, trained to vertical shoot positioning. Adding to the character of each site are the personalities who actually care for the grapes, the team of dedicated and passionate local growers, who work tirelessly throughout the year to produce the exceptional fruit which is the life blood of Kellermeister. Vines are encouraged to achieve good flowering and fruit set, ultimately yielding small berries with very good flavour concentration. Steady ripening consummates the perfect balance of sugars and refreshing natural acidity to rein in the fruit. Brilliant straw in colour. Elegant crunchy pear flavours supported by tropical fruit characters of lychee, guava and passionfruit. A delightfully refreshing experience, finishing as crisp as a clear spring morning. Perfect to savour every drop with or without food.